A republican prisoner who is appealing his conviction is also taking a legal action against the 26 County state in defense of his right to use the Irish language after the Special Criminal Court in Dublin refused to provide a transcript of proceedings in the Irish language. 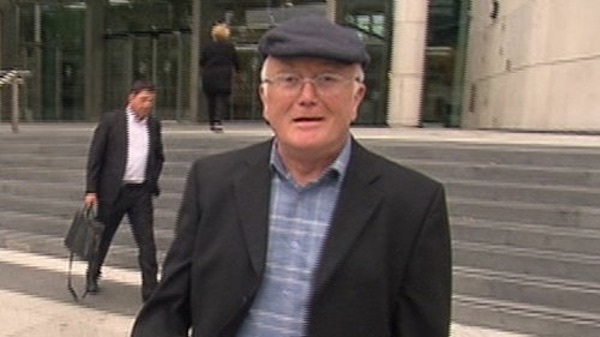 Donal Billings (pictured) was convicted by the non-jury court in 2016 over an alleged armed action during a visit by England’s Queen Elizabeth to Ireland in 2011. Mr Billings was found guilty of possessing an explosive substance at Longford railway station car park on May 16th, 2011, and was sentenced to eight-and-a-half years imprisonment. Mr Billings, whose trial was partly heard in Irish, is conducting his appeal through Irish also. It is the first case to be heard in Irish since the Court of Appeal was established in 2014. He is bringing a challenge to the soundness of his conviction. Ronan Munro SC, submitted that there was insufficient evidence that the bomb was placed on the bus in Longford. Advancing his arguments in Irish, which were translated for the judges, Mr Munro said the charge should have been thrown out at the close of the prosecution’s case. Counsel for Billings, Martin Giblin SC, separately submitted that the State had failed to uphold his client’s Irish language rights. He noted the Explosive Substances Act 1883 had never been translated into Irish. He also said the Special Criminal Court failed to protect his client’s Irish language rights when it refused an application to provide an overnight transcript of proceedings in the Irish language. Mr Giblin said his client’s Irish language rights were “decimated” and “destroyed”. He said his client’s trial was unfair under Article 38 of the Constitution and that he did not get a trial in due course of law. In a separate development, a republican prisoner in Maghaberry jail is set to take legal action over a lack of Irish language classes. A failure by authorities at Maghaberry prison to provide Irish classes for prisoners is a breach of the Good Friday Agreement, a campaign group has warned. Ciaran Mac Giolla Bhein from Conradh na Gaeilge said the “denial or removal of Irish classes is in contravention of the Good Friday Agreement and other international treaties, ratified by the British government, aimed at protecting and promoting the Irish language”. Gavin Booth, of Phoenix Law, confirmed that court action has started. “Given that funding is in place for this post, the long-term and ongoing failure to appoint an Irish language teacher appears inherently unreasonable or irrational without further explanation,” he said.